David was the eighth and youngest son of Jesse from the kingly tribe of Judah. As an inexperienced boy armed with only a stick and a few stones, David courageously confronted the nine-foot, bronze armored Philistine giant, Goliath, killing him after skilled warriors had cowered in fear. David became commander of King Saul’s troops and was successful in battle against the Philistines. He succeeded King Saul in 1010 BCE. A warrior, skilled musician and a writer of psalms, King David built Jerusalem and ruled it for 40 years (until approximately 970 BCE). During that period, he united the people of Israel. King David bought a threshing floor for 30 pieces of silver that is presently known as the Temple Mount. This site is where the First Temple was built under his son King Solomon’s rule, proof that the Jewish people are the rightful inheritors of Israel. King David is the personality most mentioned in the Bible, more than our patriarchs and more even than Moses, with a detailed description of his life and deeds, from the moment he left his father’s home until his last days. Details of his life and time can be found in the Book of Samuel and Chronicles I. King David is regarded as the author of the Book of Psalms, and the Book of Ruth gives details of his genealogy. He was a son of the tribe of Judah, whose family lived in Efrat, today Bethlehem. From the Scriptures it appears that King David had a many-faceted personality, which sometimes revealed contrasting features, making him a special figure in the annals of the people of Israel and mankind as a whole. A man of status who was loved, modest and righteous on the one hand and a successful statesman and creator of a dynasty on the other. He was an accomplished musician, a military hero and clever tactician. A tough character, but sometimes soft and sensitive, and beyond all a man who believed and trusted in G-d, a spiritual person who laid the foundations for G-d’s temple. His path in life was not easy, and was a series of ups and downs. At times he was faced with difficult circumstances which would have caused any other man to lose his faith in G-d, but David did not give in and he faced all obstacles with wisdom and intelligence. During his life, he kept his faith and did not lose sight of his destiny. He did not divert from the path of righteousness and kept both his modesty and belief in G-d even after achieving success and fame. In the Book of Samuel there are detailed descriptions of the difficulties that troubled David before and after he became king, but much less is written about his successes and achievements as King. King David has been said to have had “superior qualities” and to have been “the best of Kings”, and David has always been known for his superior personality. Because of this, the lessons learned from the various stories about his life are applicable to everyone. The Bible’s first description of David focuses on his physical beauty, “a redhead with beautiful eyes and good looks,” and later on, when describing the boy from King Saul’s court, the Bible mentions his beauty once more. Because very few of the figures in the Bible are described by their physical characteristics, we may assume that David’s physical appearance was special. David is loved by all, in spite of the few who make an effort to degrade him in the eyes of the general public, though without success. The degree to which David was loved by all segments of the people cannot be said of any other figure in the Bible. From his youth David was known as a gifted musician, and his violin playing in Saul’s home brought Saul much pleasure. He also invented many musical instruments which were later integrated into the Temple’s rituals. David was also well known for his singing and dancing talents, and was capable of blending these gifts into his praying. Even to this day, the Book of Psalms, which was composed by David, is an integral part of our prayer ritual. In David’s own words, ”My heart was not haughty, nor were my eyes lofty; I did not seek matters that were too great and wondrous for me” (Psalms 131), one may detect his modesty. David many times used the phrase “who am I”, which shows the way in which he viewed his position and his proper place between man and G-d. From what is written in the Bible we can witness his modest behavior and see that he credits his achievements to the People of Israel and G-d. True righteousness is shown when a man acts righteously though not required to do so, and does not expect to be repaid for his actions. Also, a righteous man is always loyal to his allies and his promises. David showed all of these traits during his lifetime. An example of his character is the way in which he treated Saul while being pursued by him. Although David knew that from a legal standpoint he could kill Saul, he still kept his promise to Saul, “The Lord will judge between me and thee, and the Lord will avenge me of thee, but my hand shall not be upon thee” (Samuel I, 24,12). Upon becoming King, the spirit of G-d dwelled upon David at all times and this was the source of his intelligence, heroism and prophetic capabilities. To this day, David is known as a “Man of G-d” who possessed a special connection with his creator. David always believed in the words of the Prophets and accepted their judgments even when he failed. The priests became an integral part of his government and thus the Law of the Torah guided his policies during his reign. David was known as a “Soldier of G-d”, both during his lifetime and after his death. King David’s intelligence and cunning allowed him to keep his humanity even during times when he was humiliated and embarrassed. Even when David was isolated or working in the service of a foreign king, he continued to fight for the nation of Israel and do G-d’s work. David knew how to find the correct balance between harshness and mercy when dealing with those nations that he conquered. He also had the ability to be on good terms with other neighboring countries. In this manner he was able to build a large kingdom and manage it well by appointing representatives in faraway places. David deeply believed that all of his victories in war were the result of G-d’s willingness to save the People of Israel, and he did not lose any of his belief in G-d all through his chain of victories. This can be seen during the battle with Goliath when David said “the battle is the Lord’s, and he will give you into our hand” (Samuel I,17,47). David is well known for his courage and cleverness, along with a military instinct with which he was born. Stories abound regarding struggles in which he overcame wild animals that attempted to attack sheep in his flock. David insisted on leading his troops into battle, until his forces convinced him not to do so for fear that he would be killed. In addition to being an exceptional warrior,r he was an extraordinary general, who knew how to lead his troops and was capable of bringing soldiers from all walks of life into a unified fighting force. This military capability enabled King David during his reign to expand his kingdom from Egypt to Iraq. These capabilities stayed with him during his entire life. Even when he was pursued by his son Absalom, he was able to organize his forces and work out a strategy for battle. 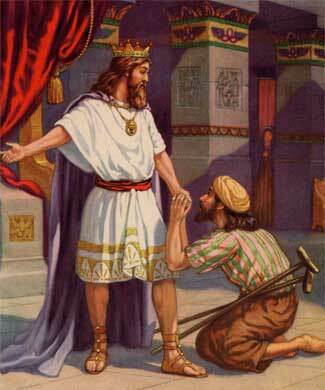 As King, David brought law and justice to his people, and Jerusalem became a symbol of a city of justice. David himself expressed his belief in G-d, and commanded his son, Solomon to follow his example and follow the path of G-d.
One of the reasons for David’s greatness is not only that he admitted to his sins, but that he also accepted responsibility for those sins in instances where it was possible to put the blame on others. David believed that in order to fully repent for one’s sins, the individual must endure a period of suffering. An example of this is the suffering of David with regard to the rebellion and death of his son Absalom. David believed that these events were the result of his sins in his relationship with Bat Sheva. He believed suffering to be an integral part of the process of repentance and forgiveness. G-d commanded that only Solomon would erect the Temple. But David did organize the Priests and the Levites and the structure of the services that would be used in the First and Second Temple. G-d promised David that the connection between G-d and his descendants would be forever, “and thy house and thy Kingdom shall be made sure forever before thee, thy throne shall be established forever”, (Samuel II,7,16).